Carbohydrates. We tend to have a love hate relationship with them. They are filling and satisfying, yet we run away from them because we are told they make us fat. With all the conflicting news out there, no wonder we are confused and left to ponder … to carb or not to carb? Everyone else seems to be giving their opinion about carbs, so I figured it was about time that I did the same. After playing around with low-carb and gluten free diets for the last year, I thought it was only fair that I give my own “review” of carbs. 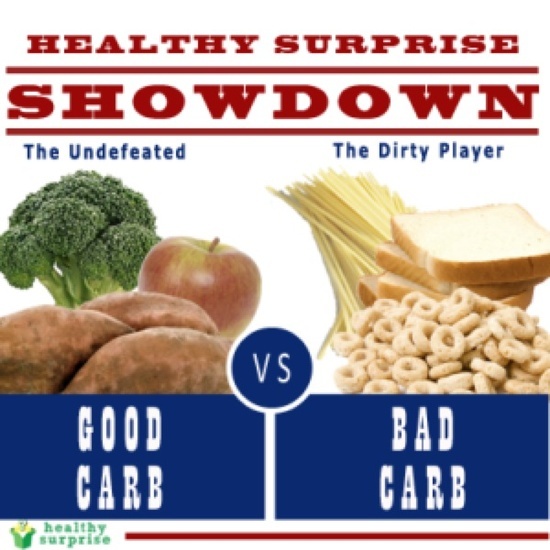 Are carbs your friend or enemy? Are you the type of person that can eat as many carbs as you want and not see even the slightest difference in your weight and pants size? If so, you are lucky, of the few and know that most women hate you. There are some people that can just metabolize carbohydrates much better than others, making carbs their friend. Then there are the other majority of women who “hate” carbs or at least say they do because of how it effects their body (size and weight) and try desperately not to go near it. For them, just looking at a piece of bread makes them gain a pound. Well, have you ever thought that maybe changing the way you think about carbs and how you eat them could change how they impact your body? Is it possible to find room for carbohydrates in your life without worrying about gaining weight? In my opinion yes. Just as you would with a “frienemy”, it is wise to keep carbs part of your life so you can always keep them in check and be sure they can’t sting you later. I like to live by the motto of “everything in moderation.” It is all about finding the balance and what works best for your body. From my experience of cutting out carbs completely I have found that I saw fast weight lose results, but I was left feeling very hungry and cranky. I had to eat more often when I wasn’t eating carbs and it just wasn’t a maintainable lifestyle for me. I have and still do experiment with gluten free living because I suffer from chronic migraines and was told that gluten could be the culprit. I would say today I lead a 75% gluten free lifestyle and it has helped me a lot. For me, it is about finding the right kind of carbs to eat, pairing them with the right foods and the timing in which I eat them is most important. People forget that carbs come in all shapes and forms. Bread is the most well known carb, but so is an apple … a sweet potato … and broccoli They can be green, pink, white, orange, starchy, non-starchy … the list goes on. Not all carbs are created equal, but the problem with people cutting all carbs out of their life is that they miss out on some key nutrients in their diet that could be harming their weight management efforts. Always pair a carb with protein for each meal or snack to keep you full longer ( apple and string cheese, almond butter on Ezekiel bread or quinio with chicken and spinach). Eat carbs earlier in the day, not after 3pm. Everyone’s body is different. From trial and error and some of the research I have done on carbohydrates, I have found that by eating carbs earlier in the day my body has more time to use and burn the energy I get from eating them. With the exception of quinio at dinner, I tend to stop eating carbs after 3pm. Granted, there are definitely times when my sweet tooth gets in the way, I want a piece of pizza or I am craving some fruit in which I may stray from this rule. But I would say that 80% of the time I try to abide by it. I do this not because I am trying to be overly strict on myself, but because I have found I feel better when I eat this way. So do yourself a favor and don’t deprive yourself of carbs. Just find the right kind to eat and the right time to eat them. Everything in moderation is key. 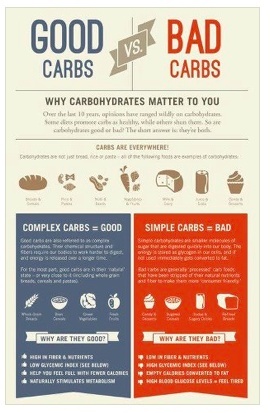 For more information on why carbs are important in your diet and which carbs you should be eating, check out the helpful links below. This entry was posted in Food, Lifestyle, Uncategorized and tagged carbs, Gluten Free, healthy living by find your healthy haven. Bookmark the permalink.